VA’s Office of Mental Health Services (MHS) Web Services team has worked closely with Anthology since October 2013 on both communications and research projects. MHS Web Services develops online courses to help veterans, service members and their families with a variety of tools to improve overall mental health and well-being, including insomnia, problem-solving, parenting and managing anger. In preparation for site and product development, The Anthology team facilitated more than 80 online (virtual) focus groups to understand veterans’ mental health needs, test messages for promoting MHS’ products and services and gather feedback on specific products’ usability and relevancy. Anthology developed the recruitment screener and moderator guides, facilitated the panel discussions; and authored the detailed analytical reports. 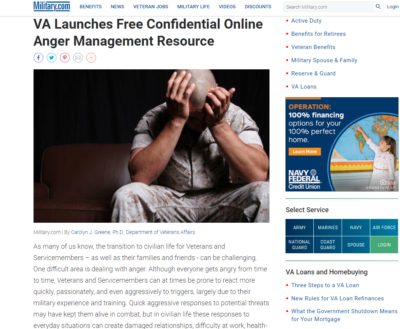 These findings and insights were used by the client to further develop the courses on the Veteran Training Portal, understand how Veterans seek information online about health topics and further explore barriers and opportunities surrounding the stigmas associated with mental health. writing and editing content including materials, blogs, articles, social media content and more. Additionally, Anthology developed monthly, quarterly and yearly analytics reports – taking content from Google Analytics and determining what communications strategies were effective in driving users to the site and to take courses, and making recommendations to the client based on the analytics. Since the launch of the VA Online portal, more than 500,000 users have visited the site and used the tools.